I can tell the walls of my house aren’t well insulated; they’re always cold in winter. How can I cut down on the heat loss? Many houses have this problem. The fiberglass batt insulation used in wood-frame walls can’t stop energy losses due to air leakage through the wall assembly. Even when perfectly installed, the batts don’t provide much insulation value. One option for upgrading wall insulation that’s gaining popularity is the installation of injection foam. 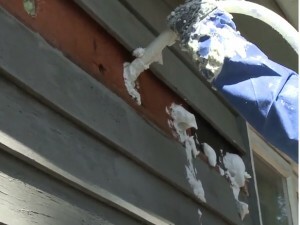 The Air Krete® injection foam available from Dr. Energy Saver is usually installed through small holes drilled in the exterior siding or sheathing. The holes are plugged after installation. Thanks to its shaving-cream consistency, this foam can flow around existing underperforming fiberglass insulation, completely filling and sealing each stud cavity. Air-Krete’s higher R-value (nearly R-4 per in.) combined with its air-sealing ability will make any exterior wall much more energy efficient.